This morning I was reminded of a an 'incident' that occurred when I was a kid living on Fourth Street. Oh, how I loved that rickety, old house. I was built in the late 1800's, if I remember correctly. We had to put shims underneath all of the dressers to keep everything from sliding off the top. But, when you're a kid - you don't care about that kind of stuff. What you really care about is the old ball and claw foot tub that lets you take the deepest, longest baths that a girl could ever care to take. That, and the formal dining room with a big, bay window. The window where we always put our Christmas tree each year. And the old iron grate heat registers that we would all fight over every winter. It was a race to see who was going to be able to stand on it first when the heat kicked on. The same grate that my dad dropped my sister on her head on when she was an infant. Now we know what's wrong with her! Oh, wait...that could possibly be me that everyone wonders what's wrong with. Naaah! Couldn't be me. Back to the house. It also had what we called an 'old Michigan basement'. Michigan basements were dark, dank, stone basements with lots of little rooms and compartments. Ours had cubbies in some of the walls. Not the kind that are put there intentionally, mind you - the kind that happen over time because they're so old that they start to crumble. We used to imagine that our basement was part of the underground railroad that used to come through town and that southern slaves had sought refuge from their bonds - possibly right there. Oh, how I loved that huge, old house. Except, now when we make a trip home and drive by it (we moved from there when I was 12), it's not as huge as I remember it being. Actually, it's not that huge at all. Isn't it that way with a lot of things we remember from childhood? We remember things being much grander than they actually were simply because we were so small. 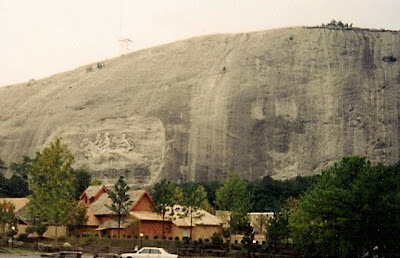 My husband had the same experience when we visited Stone Mountain Georgia a few years back. He had lived there when he was a kid and had told me about the carving that took up the whole side of the mountain. Imagine his disappointment (and mine) when this is what we saw. You'll have to look really closely at the left side of the picture right above the trees and buildings. But, you'll have to excuse me because, I digress. We aren't talking about cool houses or mountain carvings today. We are supposed to be talking about something that happened while I was living in that cool, old house. So, let's proceed. Shall we? It was shortly before Christmas and my mom had had a very disturbing dream. So disturbing, in fact, that she told the family about it. Her dream was that a burglar had broken into our house on Christmas Eve and had stolen all of the presents from underneath our Christmas tree. You know, the one in the big, bay window. It really rattled her. I think she took some railing over the fact that it rattled her like it did. Christmas was fast approaching and we were counting days. The night of December 23rd we headed for bed knowing full well when we woke up it would be Christmas Eve! That meant a big family celebration that night. Little did we know that we would be having a little more excitement than we had hoped for. Wow...stone mountain is right! That is the biggest rock I've ever seen! Oh, man...another TBC! I can hardly bear it!